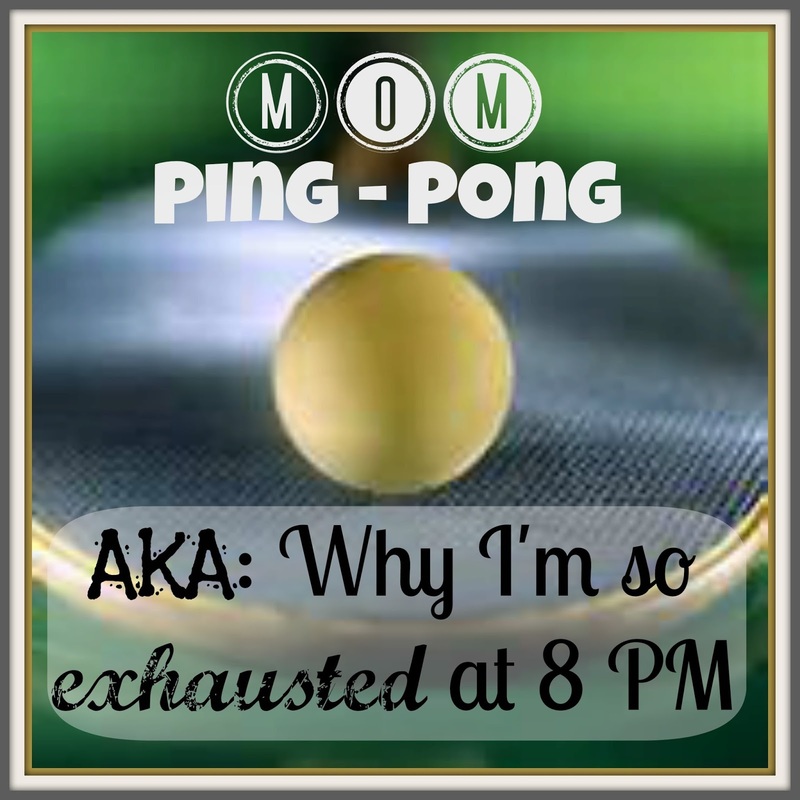 Mom Ping Pong – also Why I’m So Exhausted at 8 PM…. We’ve recently moved into a new house and we have a few maintenance issues to get taken care of. Every day this week we’ve had someone out doing something at the house. And every. single. one. of the technicians was ridiculously late. You know the 4 hour window that they give you? Yeah. Most of the techs were way past their “windows.” One didn’t even show. I had to reschedule that one for another day. So, our schedule is off and some days we’ve been stuck close to home. I made it through my day fairly well. I was brave (read: INSANE) and took all 5 kids to the swimming pool by myself. I got mad props from every other mom there – they made lots of comments. They spent most of the time at the pool watching me juggle all the kids. I was the water taxi with Punkin on one hip and Ladybug clinging to my other arm. Curly loved trying to swim between my legs and tickling my feet. Bee and Tiger kept jumping in and swimming to me, clinging on to my swimsuit to catch their breath. I almost had some disastrous wardrobe malfunctions. We were pretty much the entertainment for the entire pool. After we got home I realized that I had nothing to eat for lunch so we piled in the car to pick up lunch. I got everyone fed and Ladybug and Punkin napped at the same time! This is a big deal! I had a great afternoon with the big kids – reading books, playing, and making our own crayons. Then Ladybug and Punkin both woke up and one of the technicians showed up. That’s when I was thrown into the ping pong death match. I put the oldest 4 kids on the patio with our homemade popsicles. I tried to nurse Punkin on the couch while our alarm system was set up. During this process the tech set off the sirens twice. This caused Punkin to have a screaming fit and the big kids to rush inside in a panic. I was up and down trying to nurse, calming Punkin, shooing the kids outside, and shutting the door. Back and forth, back and forth. The kids came inside and trailed blueberry sticky popsicle goo all behind them. I grabbed each of them as they came in the back door and start wiping them down. They each left the door open behind them so I ran back to shut it every single time. Ladybug took off running and smeared blueberry popsicle all over the couch and table. I followed after her with paper towels. While I was starting on their clothes, Punkin started screaming. I run into the room and get Ladybug off Punkin. She was trying to “hug” (or crush) her. I go back to work on laundry. Then the alarm tech needs me in the other room. Then Tiger and Bee start fighting upstairs. Up I go to mediate. Down I come to help the tech. Ladybug streaks through the room in nothing but a diaper. She’s still sticky so I chase after her again. Meanwhile Punkin cries. And what is Curly doing? Sitting at the table doing her Bible study. Sweet little thing! Does she not hear the noise?? We make it through that hour and then I start dinner. I’m trying to cook. I’ve recruited Curly to feed Punkin. They are making a tremendous mess and there are prunes on Curly’s arms, on Punkin’s face, arms, outfit, and her chair. They even ended up on the floor in a sticky puddle. The sticky puddle reminds me of the sticky popsicle puddles on the patio. I run outside to wash the patio. Inside Ladybug pounds on the windows screaming for me. I come inside and start cleaning the sticky prune mess. Then I remember that I was cooking dinner. Back into the kitchen I go with Ladybug trailing behind me. She insists on smelling every ingredient I get out as I cook. I ‘mell it Mommy!!! I tell Tiger and Bee to dust the blinds as part of their chores. They get out the step stool and dusters and get busy. They spend most of the time fighting and hitting each other with dusters. Soon they are running through the house using the dusters as swords. Ladybug joins in and I cannot hear myself think. I alternate between running into the room to stop the fighting and screaming, checking on Punkin and helping clean her up, and trying to keep from burning dinner. After dinner I attempt to bathe everyone. I put Ladybug and Punkin in our big tub and quickly get Punkin out to dress her. Ladybug is screaming so I have Bee sit with her while I dress Punkin. Tiger and Curly are supposed to be picking up the living room but I can hear them arguing. I run back and forth with a half-dressed Punkin to help them work things out and to comfort Ladybug who now wants out of the tub. I have to feed Punkin so I keep Ladybug in the tub and send Curly in to supervise and play with her. Now Bee and Tiger are sent upstairs to clean their rooms. I get Punkin down and go to get Ladybug. She has taken the water in the tub and used cups to pour it out all over the floor of our bathroom. It’s a lake in there! Curly is calmly lying on one of the rugs watching Ladybug play. I ask her what happened and she tells me that Ladybug poured water on the floor. Yeah! I got that part! I asked her why she didn’t stop her, take the cup away, or come get me. She shrugs. I get Ladybug out and I start mopping the floor. I have to take frequent breaks to go stop the arguing between Bee and Tiger who are now throwing things at each other. I finally get the floor clean and head upstairs. Ladybug is streaking through their rooms without any clothes on and Bee has joined in on the fun. I put Bee in one tub and start water in the second bath for Tiger. I turn around and Ladybug is trying to pee on the carpet. I grab her and throw her on the potty. Then I go look for a diaper. I wrestle Ladybug into her clothes and then run to get soap and shampoo for Bee. I help Bee wash her hair and then I run to the other bathroom to help Tiger with his hair. When I come back to check on Bee, Ladybug is trying to dive head first into the tub with her. I rescue her and send her to her room with Curly and a stack of books. Then I run to give Tiger soap and come back and give Bee soap. Then I get them each towels. Then I run to one bathroom to do conditioner, then the other bathroom, then into Ladybug’s room to check their progress, then back to help Bee dress, then to help Tiger, then I brush Bee’s teeth, then I tuck in Ladybug, then I help Curly get her bath started, then I brush Tiger’s teeth, then I help them pick up their rooms, then I help them find their waterbottles, then I take Curly soap, then I hang up Bee’s towel, then I condition Curly’s hair, then I find Tiger’s towel and hang it up, then I find the hamper and dump in the dirty clothes, then I help Curly find pj’s, and then I check the clock. Hurry up bedtime!!!! And that’s the game of mom ping pong. That is what I do each and every day. I run up the stairs; I run down the stairs; I run into one room; I run into the next room; I help one child with this; I help another child with that; I clean this mess; I clean that mess; I stop this fight; I end that argument. This is why I am ready to collapse at 8 PM. But after our long night of messes and fighting and arguing I curled up on the couch with the big 3 to have our reading time. Tiger sat on the back of the couch on my right and Bee sat up high on my left. They took turns doing my hair with combs and pretending to paint it with lego blocks. Curly sat at my feet and built block towers and we read chapter after chapter of some of their favorite books. Then they each leaned in and gave me a hug and kiss as they went upstairs to bed. And that’s the reason why I play the daily ping pong game! Hi Lexi – we met at the pool! I am really excited to meet you and find your web site – looks awesome. It seems we are like minded in many areas. I hope we can get together sometime. That is a sweet story and a good reminder why we do what we do everyday. I love that baby face! I have many, many days just the same!